I've been feeling a little low and left out of things lately but I definately felt the love yesterday even by the number of people that kindly wished me a lovely day on my facebook wall. I was spoilt rotten by everyone, receiving some lovely cards, gifts (a new craft cutter and a Pandora bead), pennies (Joe Browns here I come). I also get to celebrate all week by eating as I'm lunching or having breakfast with someome special every day this week! Not sure I shoudl bother weighing in on Friday! 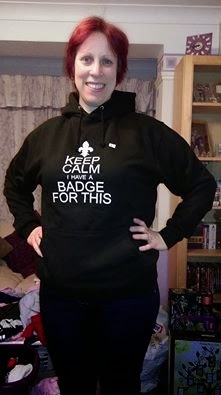 One of my favourite gifts had to be my new Scout swearshirt courtesy of my wonderful friend Sue.. Thank you to everyone that made my day very special.